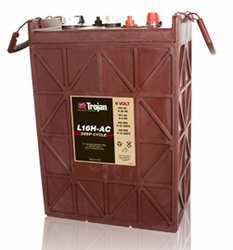 Trojan L16H-AC 435 AH Deep Cycle Battery Free Delivery most locations in the lower 48. Cost of this battery in Minnesota. Wisconsin, Iowa, Illinois, Kansas , Missouri Nebraska Oklahoma and Texas is $389.99. Trojan Deep Cycle Storage Battery this battery has the most Amp Storage capacity of the L16 series Batteries. Length 11.575" Width 7.125" Height 16.87"